Gardeners who enjoy growing vertical vines with prolific blossoms often enjoy adding one of the many clematis varieties to a sunny growing spot. Although many clematis varieties will climb a vertical structure, others ramble along walls or between structures with thick foliage and showy blossoms. Clematis Rooguchi is an energetic, non-climbing clematis variety with lavender bell-shaped blossoms that bloom continuously throughout the entire growing season. 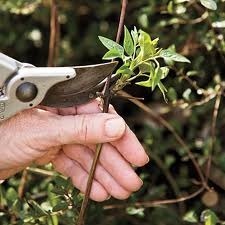 Prune a clematis Rooguchi to keep it healthy and attractive. Trim back the clematis Rooguchi in late winter before new growth begins. Remove all dead growth from the vines. Look for damaged growth and remove these vines also, trimming back to the point where the vines appear healthy. Don’t perform any thinning of the clematis at this time except to remove dead and damaged growth, because you could remove vines that will produce blossoms. Deadhead the blossoms throughout the growing season to keep the clematis attractive. 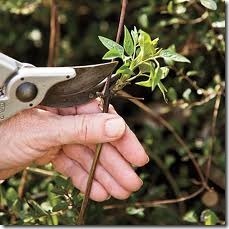 Cut the spent blossoms off the vines immediately under the blossoms with the pruning shears. Prune the clematis again in the autumn to remove vines that have just finished blossoming. Remove congested growth and thin the clematis, if you desire. As you clear out the spent vines, the clematis will continue to grow in a compact and bushy fashion instead of spreading out and getting lanky. To determine whether vines are dead or alive, cut a vine with the pruning shears and look at the crosscut section of the vine. Dead growth will appear gray and dead inside and healthy growth will have a green center that indicates living vines. Clematis Rooguchi blooms on both new and old growth, making this clematis variety an exceptionally prolific bloomer.